The Huffington Post is reporting that Canada Post Continues To Stand Still As The World Passes It By but that is simply not true. 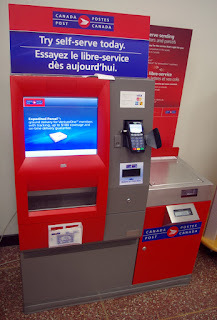 In reality, the Postal union has some great ideas for innovation while Canada Post and the Canadian government let that brilliant opportunity pass them by. The Huffington Post article regurgitates the same old rhetoric about getting rid of the postal monopoly. Mail volumes are declining. We could easily go to second day delivery. Parcels are the way of the future. Canada Post delivers Amazon and online orders. Instead of fighting over table scraps by getting rid of the postal monopoly we need to look at getting rid of the banking monopoly. That is where the real money is. The Union is suggesting we bring back postal banking. That makes sense. Especially in rural areas: #ABankForEveryone Breaking the bank monopoly would be in everyone's best interest. Look to Germany for a good example of the "Postbank" concept. Postal banking might be a good idea, especially in areas the banks don't want to go and that could include inner city neighbourhoods. The service ought not to be contracted out though. We need postal offices in rural areas and not the current system of contracted out post offices. The contracting out of post offices began in the Mulroney years and it needs to stop. Rural post offices were part of making a community vibrant. Home delivery needs to be restored in many areas. Its not like seniors can get to some of those post boxes during the winter. This is Canada and just have a look at the weather. The real reason Harper started dismantling the Postal deliver system is because he and the federal Liberals failed to contribute their end of the Postal worker's pension monies into the fund. They did that for 19 years and was one of the reasons Paul Martin was able to "balance" the budget. sort of like Christy Clark taking money out of ICBC and B.C. Hydro. For 19 years the federal government didn't make their pension contributions. any other employer would be behind bars, but the 3 P.M.s involved, well they're all doing just fine. The postal carriers, they lost their jobs. the tax payers of Canada will have to make up the monies for the lack of funds in the pension fund. During all of this time the Corporation had at least 23 vice presidents and they all had private club memberships. We can still purchase money orders at the post office, but it would be better if they were postal workers so there would be a tad more privacy and confidentiality.